ABM commissioned us to build a complete digital experience that would not only showcase their services but also drive engagement and conversions. ABM provides building maintenance and facility management for commercial properties and their services run the gamut from cleaning to energy management. Ultimately, we designed a website and accompanying mobile apps to be a complete virtual city. 9K9 built the frame work around Sitecore’s Enterprise Content Management System this CRM uses .NET specifically C#. 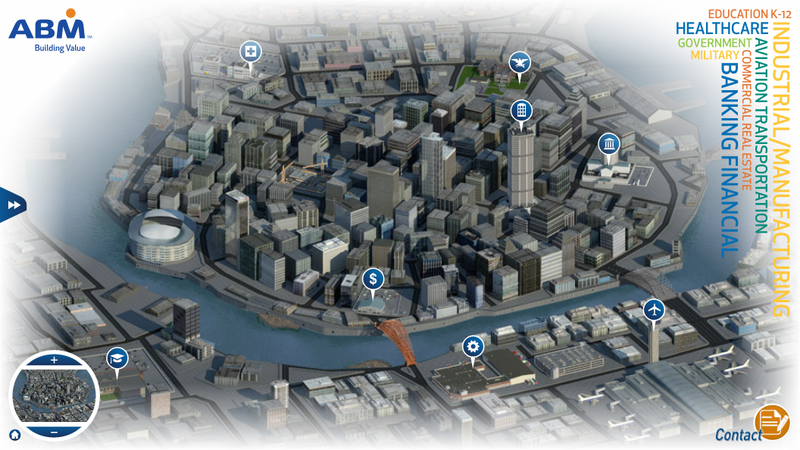 The front end virtual city was also built on a game engine 9K9 wrote utilizing Microsoft’s Silverlight technology and interactively walks users through the ABM advantage specific to their needs. Being an industry leader, ABM has trail blazed a large variety of offerings. Our challenge was to communicate all of ABM’s services in a visual way and identify what content would be relevant to what audience, and do it elegantly. We addressed this challenge by using proven game mechanics to allow users to go through initial discovery phase naturally. By clicking on a building, it reveals animated workers inside performing the full spectrum of ABM’s services. Our team of character modelers, animation, and programmers used Maya generated sprites and Silverlight coding to bring over 50 animated workers to life. Sitecore also enabled 9K9 to create an expansion plan for Metropolis as the site scales. Expansions to Metropolis already include additional buildings, parks and even a sports stadium.